Tropical storms that originate above oceans in tropical areas and move toward the coastal areas brings about large scale destruction because it is accompanied with violent winds and heavy rainfall. This is one of the most destructive natural calamities. They are known as Cyclones in Indian Ocean, typhoons in the Western Pacific, Hurricane in Atlantic,and Willy-willies in the Western Australia. 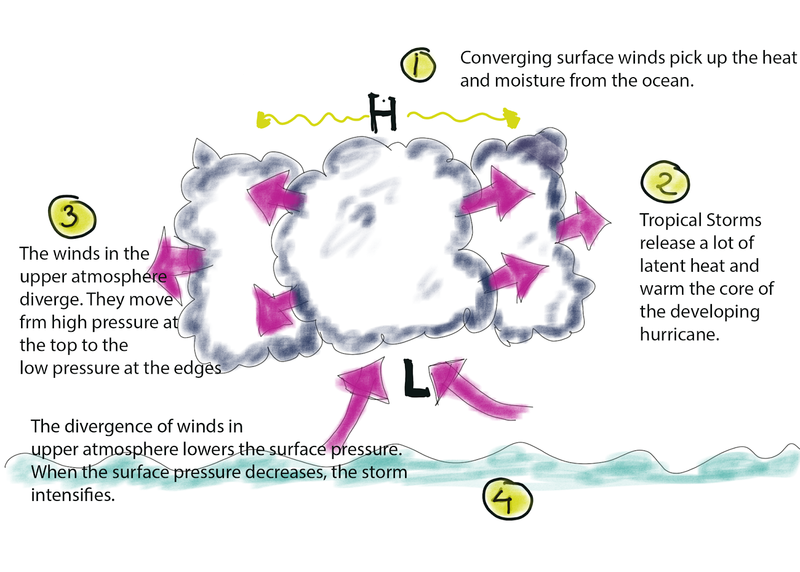 Tropical storms are quite unique because they usually only occur during the warmer months of the year. This is because the sea temperature where they form has to be higher than 27 degrees. The wind shear also has to be quite low. They form because of the warm air rising and condensation occurring. Over the sea, this is something that naturally releases massive amounts of energy, giving tropical storms their power. As the air rises, areas of low pressure form. The equator is home to easterly winds, which is why tropical storms can be tracked moving towards the west. One fun fact about tropical storms is that it is actually the rotation of the Earth that causes them to spin. This is because it deflects the paths of the winds within the tropical storm. As it moves over warm water, it gathers more energy and gets stronger. This causes those same wind speeds to increase. If they travel over cooler water, then the opposite occurs. Large sea surface with temperature higher than 27°C. Presence of Coriolis force (rotation of the earth). Small variations in the vertical wind speed. A pre-existing weak-low pressure area of low-level-cyclonic circulation. Upper divergence above the sea level system. 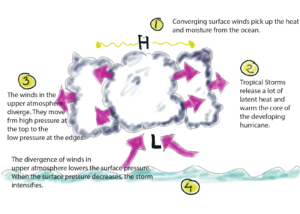 What Do Tropical Storms Look Like? It is incredibly easy for us to spot tropical storms when we are looking at satellite imagery. They have a distinctive circular shape and, as we have already mentioned, they spin. Because of the rotation of the Earth, tropical storms in the southern hemisphere spin clockwise and tropical storms in the northern hemisphere spin anticlockwise. We refer to the centre of a tropical storm as “the eye” of the storm. It can be dozens of kilometres across and it is caused by air descending in the centre. The eye of the storm could be characterised as quite a peaceful place with the eyewall surrounding it. Converging surface winds pick up the heat and moisture from the ocean. Tropical storms release a lot of latest heat and warm the core of the developing hurricane. The winds in the upper atmosphere diverge. They move from high pressure at the top to the low pressure at the edges. The divergence of winds in upper atmosphere lowers the surface pressure. When the surface pressure decreases, the storm intensifies. Most natural disasters can have both primary and secondary effects. Due to the amount of energy that tropical storms have, a lot of structural damage is visible straight away. It is also common for areas to flood. During the tropical storm, people may drown or they could easily get killed because of the structural damage that surrounds them. It is also incredibly common for people to get seriously injured. Transport links are usually damaged and cut off. The same can be said about energy supplies, which can inhibit the way that people can communicate immediately after a tropical storm. The ways in which people respond to the primary effects of a tropical storm are known as immediate responses and they actually begin before the storm hits land. Because we can predict the path that a tropical storm is going to take, people can usually be evacuated. In an ideal world, temporary shelters will also be set up due to the damage that tropical storms cause. Immediately after the tropical storm has hit, it is important for the emergency services to go in and recover any cadavers that may have been left behind. They should also aim to rescue anyone who has been trapped during the storm. 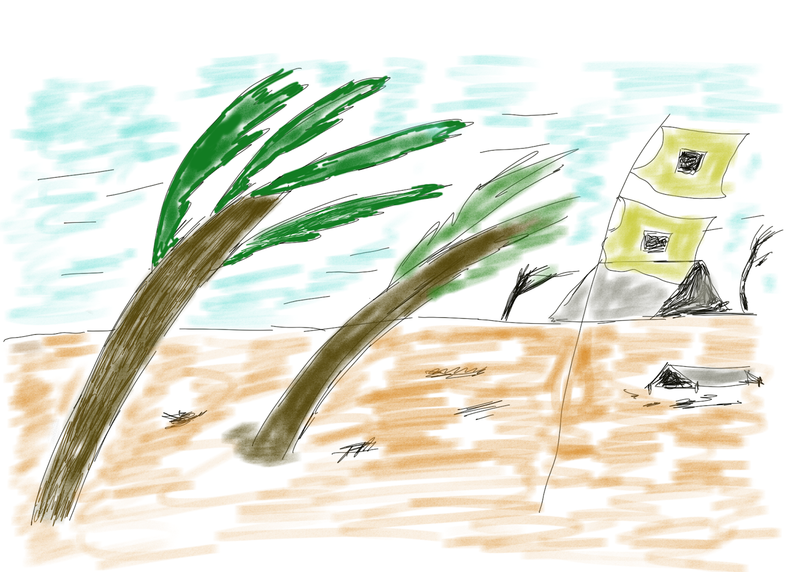 Because of the amount of destruction that tropical storms can cause, it is normal for people to be left without a home. This can cause a lot of problems, including death because are not protected from the elements. Supplies that we greatly rely on, like water supplies, often run short after a tropical storm. This can make dehydration commonplace and it can affect the way that diseases spread and how easily they do. Because of the damage to transport links, emergency aid vehicles often struggle to get to places that have been hit by tropical storms straight away. This delay can result in the loss of life. After a tropical storm, we can take a look at some of the long-term responses that are usually applicable. For example, it is important for governments to work to repair structural damage as quickly as possible so that people can get back to living their lives. A lot of plans are also put in place to improve flood defence systems that may already be present.